It's a sad day in Sony-land. Though we don't have absolute confirmation, a gander at Sony's corporate website seems to say that the company has halted new product development of this lovable robot dog, and production was supposed to have stopped at the end of last year. This despite recent scientific research showing the health benefits of robotic pets. So long my odd, robotic friend, I'll miss you. 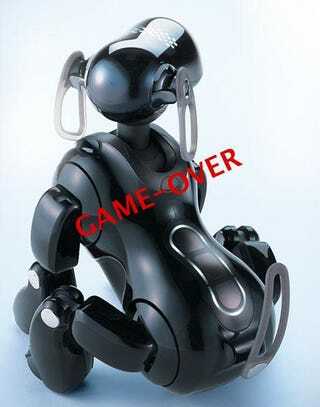 Luckily the existing breeds of Aibo age 1 year for every 7 human years, and will be alive after the nuclear holocaust to fight the cockroaches for control of the planet.